This report talks about the creation of the terror groups and the transformations taken in the war against the two organizations [ISIS & AQAP). It attempts to explain complex structures of such groups to unveil two organizations considered on top of the most violent groups in the globe. This report could demonstrate many concerns of the regional and international security by tracing the emergence of the AQAP and the IS- from establishment to the present situation in one of the hottest areas of the world that is marked by less security, more violence and threats. In the first chapter of the report which is titled: Terrorism in Yemen… from the AQAP to the IS», it traces terror in Yemen since appearance of the Afghan Arab current, the emergence of the Al-Qaeda, the combination of its two branches in Yemen and Saudi Arabia under the name of the Al-Qaeda in the Arabian Peninsula (AQAP) until the bloody version of terror came out under the name of the Islamic State in Iraq and the Levant (ISIL). It discusses the appearance of the Al-Qaeda in Yemen from the point of establishment and military action in the country, explains development of the organization until it reached the so-called Al-Qaeda in the Arabian Peninsula (AQAP) as a result of combing the two branches in Yemen and Saudi Arabia into one entity. The report indicates that the organization appeared in Yemen through the Yemeni fighters who returned from Afghanistan before Osama Bin Laden declared his Al-Qaeda organization. It affirms that the AQAP is the most energetic among the other organizations operating in countries and affiliated to the global jihad ideology of Al-Qaeda. The AQAP came from cross-pollination, its possession of capacities and training instruments and its resilience to attract popular harbor that enabled it to overcome several mistakes committed by Al-Qaeda in other countries such as Iraq and Syria. It highlights the creation of the IS in Yemen that never found a refuge in Yemen because it adopts the sectarian-classification approach, uses terror in combating the enemy which did not help for its acceptance in Yemen simply because such attitudes are not socially popular in Yemen which made the IS origination being rejected even within the AQAP. The second chapter discusses the AQAP activities, its military capabilities, its influence sphere and its ability to recruit fighters. The report attributes the growing AQAP influence to a number of reasons: flexibility towards social norms that entitled it to gain new hideouts for protection and refuge for its supporters. The AQAP behavior towards political changes in the country provided additional momentum for the organization to grow more as well as the secret US-Yemen-run prisons and the serious mistakes of the US drones against civilians made the organization capable to recruit new supporters seeking retaliation and revenge. The lack of state control, weak economic infrastructure and the political conflict are all together used by the AQAP as opportunities for external funding and have failed its combating efforts. The report confirms that the events and fighting fronts contributed also to the AQAP infiltration into local communities. The sectarian-based expansion grew largely following the Houthis occupation of the capital Sanaá in September 2014. The authority ignorance of population concerns towards Houthis ideology being imposed in their Sunni areas is also on top of factors that led to the AQAP expansion in Yemen. The US cooperation that remains active with Saleh and his allies the Houthis contributed greatly to the increasing of AQAP supporters. These factors contributed collectively to push the AQAP and its supporters to defend tribal areas under the title of protecting Sunni-areas against the Shiites. The ignorance of those communities and their demands for a solution to this problem supports only the sectarian-based expansion that benefits no one, but the Houthis and the AQAP. It says that the AQAP presence includes Shabwa, Hadramout, Al-Baida and Abyan. It uses the deserted area in Hadramout and the mountainous chain that links Shabwa, Abyan and Al-Baida as safe refuge for protection against airstrikes. It highlights that the AQAP possesses the competence to run each area independently that made disparity in terms of AQAP weapons from one place to another. In Hadramout for instance, the AQAP preserved millions of dollars during its management of Muklla from oil revenues, revenues of Muklla port in addition to millions it looted from the Post Office in the coastal city. In this context, the AQAP took control of weapons and heavy military equipment from government military camps following its control of Muklla, the capital of Hadramout when the Houthis were expanding in Aden by support from pro-Saleh forces following the 21 September 2014 coup and even during and after the UAE forces took command of Muklla on April 24 2016. The third chapter talks about the changes of the US new role in Yemen. Donald Trump came to the office in the United States of America, determined to eliminate terror groups that threaten national security of his homeland. The Al-Qaeda in the Arabian Peninsula [AQAP] is on top of such threats and that is why the new administration escalated its operations in Yemen in rapid and rugged manner. Combating the AQAP and the expansion of Iran and rebuilding USA relations with the GCC states represent the key objectives for the new USA administration. Therefore, we saw an increase of USA support for operations of the Arab-led Coalition against the Houthis. At the moment, the USA depends on intelligent information from the UAE after the former shut down its embassy in Sanaá in February 2015. The two countries even coordinate together land operations in Yemen. However, this could create conflict of priorities as Abu Dhabi has been determined to achieve other objectives related to the power and wealth in southern provinces where the AQAP is largely present to combat political Islamist groups in an attempt to dismantle cohesion of the northern areas in order to fail its opponents in Marib by dismantling the tribal structure. The first 100-day assessment report of the Trump administration in Yemen demonstrates indicators of US changes in Yemen that parallel entire period of Obama›s rule. The US attack against a village in central Yemen and the killing of dozens of civilians with no objectives achieved, marks clearly initial failure of what Trump wants to do in Yemen. The activities of the first 100 days reveal back coordination between the Americans and intelligence apparatuses that still loyal to the former president of Yemen or the Houthis, to materialize the US objectives in the country. The fourth chapter argues about the fight against terror incorporated in operations of the Arab-led Coalition that began in March 2015 against the Houthis. It focuses on military operations by the Arab-led Coalition against the Al-Qaeda in the Arabian Peninsula (AQAP) in southern provinces of Yemen. It highlights impacts of those operations on the AQAP as well how the AQAP managed to expand in liberated areas because of grave mistakes made by the Arab-led Coalition which is led by Saudi Arabia and government of Yemen. Researchers believe that the military operations against the AQAP have been marred by political exploitation that weakened its seriousness in contrary to the 2012 fighting the AQAP following the peaceful revolution in 2011. Prior that date, the regime of former president utilized the AQAP to increase his influence or to for extortion to obtain training for forces commanded by his son. It highlights military operations against the AQAP in southern provinces that started in Aden, and then moved to Hadramout, Abyan, Lahj, Al-Dhalea›and Shabwa. It focuses more on the military operations of the Arab-led Coalition in Shabwa province that was declared on 3 August 2017 by the UAE military. The force that was authorized to fight the AQAP in Shabwa is just a militia that does not receive instructions from the internationally recognized government and it is known as the Shabwania Elite Forces. Members of this militia were recruited according to tribal and clang standards. It committed grave human rights abuses in just one-month of the operation despite the fact it never clashed with any gunman of the AQAP who fled to mountainous or remote areas. It only took control of oil and gas field as well as state offices instead of combating the AQAP. The report moves then to Taiz where the AQAP and the IS spread in the liberated areas due to dependence of the Arab-led Coalition on Salafi militias and avoid the use of tribesmen which the UAE believes that those men could be affiliated to the Islah party. That provided a cover for the leader of the Salafi militia known as Abu Al-Abas to facilitate the AQAP expansion and recruitment in Taiz under the cause of fighting the Houthis. This is based on interviews conducted by researcher of the Abaad Center with officials and leaders of popular resistance and national army to access information about the AQAP in the two provinces. It concludes that the AQAP expanded due to mistakes of the Arab-led Coalition and the legitimate government whose concerns were not right and the use of jihadists against the Houthis. And the UAE uses military operations against the AQAP as a cover for achieving other objectives in the southern provinces that target the internationally recognized government and take control of oil and gas fields. It says that taking no serious actions against the AQAP in the southern provinces and pushing it towards the Northern provinces and the Yemen-Saudi border represents a future threat against the Kingdom of Saudi Arabia and desperate attempts to take control of the other oil provinces. 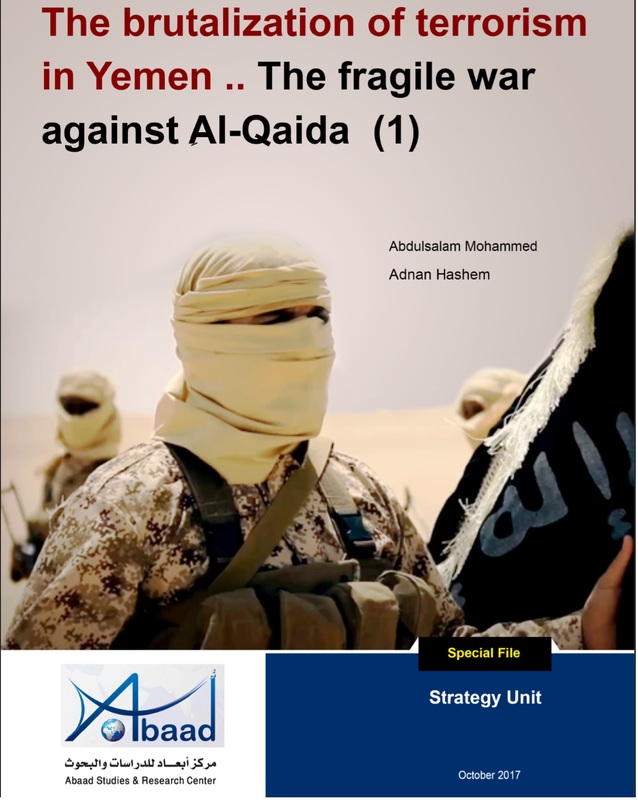 The Abaad Studies and Research Center believes that reading development and emergence of the Al-Qaeda and other violence and terror groups, factors that assist its strength with foreseeing future of the AQAP movement or external effective stakeholders would lead to setting up new measures that take into account complicated environment and avoid mistakes to save Yemen from terror. That would not be done, but with the existence of strong state that has an army and security forces with full national dogma. And militias do not produce anything, but similar militias that expand in geography and turn the political conflict into complex regional and ethnic conflicts.